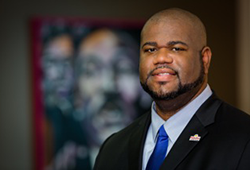 "It is critically important that individuals support historically black institutions financially," said Nicholas Perkins, president and founder of Perkins Management Services Company and a 2003 graduate of Fayetteville State University. "While there are corporations and individuals with greater resources than I, I have made a personal commitment to support the education of underserved students seeking to advance in society." With the stroke of his pen, Nicholas Perkins created a $1 million planned gift to FSUthe largest single alumni gift in the University's history. "My planned gift demonstrates my faith in and commitment to Fayetteville State University and its mission," he said. "Although this gift will be most beneficial (after my death) the need for continued support for our community will remain." Perkins's most recent gift is in response to the financial difficulties faced by many historically black colleges and universities across the country. He said he wanted to do his part in making sure that FSU continues to thrive. On behalf of the many students who will benefit, FSU Chancellor James Anderson said that Perkins is a prime example of an alumnus who appreciates what his alma mater has done for him and wants to give back. "Through this generous donation and his previous support of Fayetteville State University, Nicholas Perkins continues to demonstrate his loyalty, love and commitment to this great institution," Anderson said. "This historical gift speaks volumes of his desire to see this institution flourish and function at the highest levels. I thank him for his dedication to this University. He is the epitome of a Bronco and is a shining example of someone who gives back to the institution that has been so instrumental in his personal and professional development." A bequest is a gift from your estatea transfer of cash, securities or other property made through your estate plans. You can make a bequest to Fayetteville State University by including language in your will or living trust, or by designating FSU as a beneficiary of a life insurance policy or retirement account. A bequest costs nothing now, yet gives you the satisfaction of knowing you have provided for Fayetteville State University in the future. Gifts from your estate to FSU are exempt from federal estate taxes. If you let FSU know of your plans, we will be able to thank you now and recognize your planned gift. This information is not intended as tax, legal or financial advice. Gift results may vary. Consult your personal financial advisor for information specific to your situation.